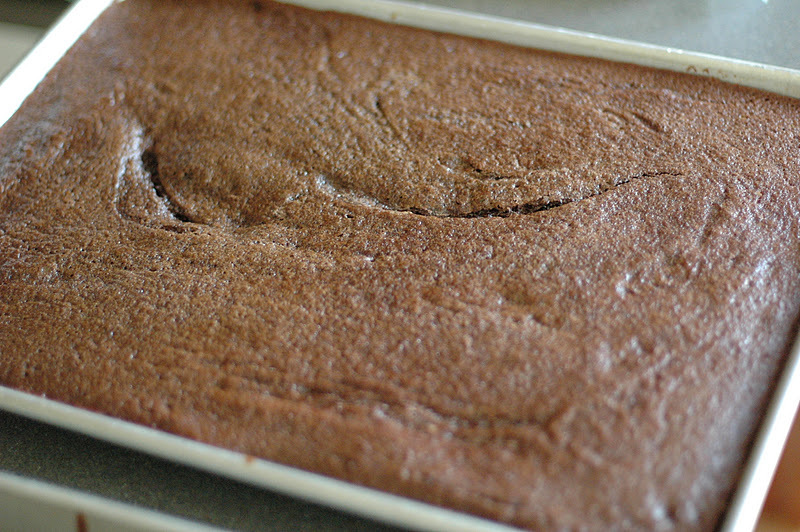 The only difference in recipes that I have found is that some people add cinnamon to their Texas Sheet Cake, and I just don’t agree. I love cinnamon, don’t get me wrong. But I just don’t think cinnamon and chocolate are meant to be together. It’s somehow not fair to the chocolate to interfere with its creamy bold greatness. I love cinnamon in rolls, and pastries and with apples, and raisins, but I would rather not have it with my chocolate cake. I got this recipe from my friend, Suzanne. It was her grandmother’s recipe. I got this recipe from my Grandmother Simpson. She and my Grandaddy moved to Oklahoma right before my mother’s senior year of high school. So, once my brothers and I came along, we always made the trek 7 hours west to Oklahoma to visit them. My Grandmother always, always, always had this cake frozen in individual pieces in her freezer. I LOVED this cake as a little girl (and still do, for that matter!!). I can still remember defrosting a piece in her microwave and topping it off with a scoop of vanilla ice cream. I can still taste the warm chocolate icing, slightly melted from its time in the microwave, scrumptiously married with the cold ice cream. A few years ago, I wanted to expand my repertoire of freezable recipes, both desserts and non-desserts. 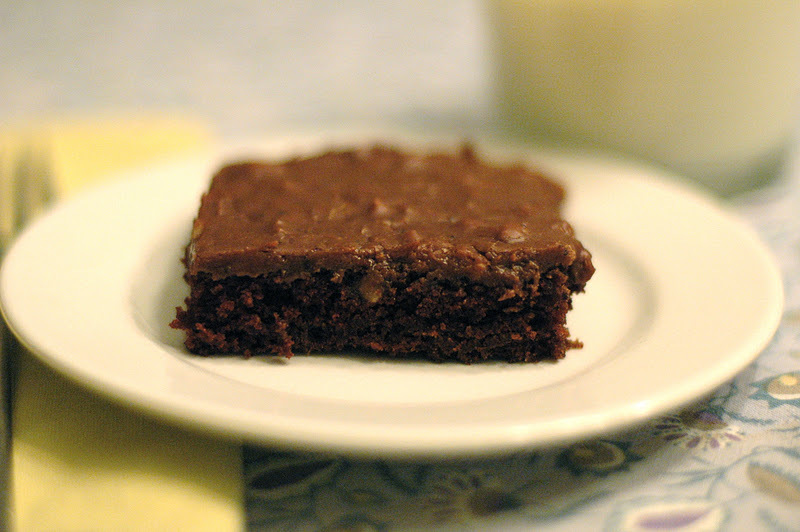 One of my first thoughts was my Grandmother’s Texas Sheet Cake! I love heirloom recipes, recipes that are pillars in a family and are passed along from one generation to the next. Not only did I love the idea of being able to make this cake, slice it up individually, and throw it in the freezer for a homemade dessert in a pinch, but I loved the idea of having this particular cake because it’s my Grandmother’s recipe. By serving this cake to my 3 sons, I’m serving them up a little piece of my childhood, a memory from my Grandmother Simpson, their great-grandmother. My Grandmother Simpson just celebrated her 80th birthday this month, so this is a special tribute to her! I love my Grandmother and love to hear my mom tell me that I’m like her in some way. Despite being separated by hundreds of miles, I have always felt extremely close to her. This recipe is just another way that makes me feel close to her. 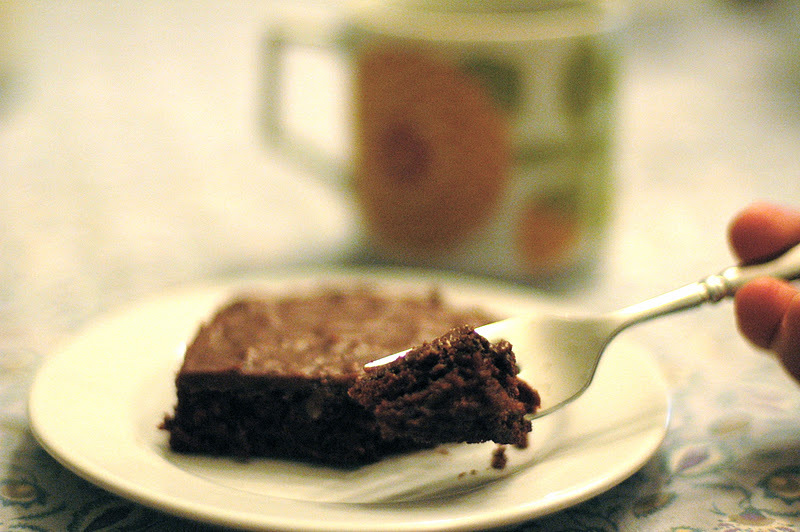 With each warm, delicious bite, it takes me back to sitting on my Grandmother’s stool devouring her yummy scrumptious Texas Sheet Cake. Zoe’s Kitchen, a favorite restaurant chain, has a nice varied menu of healthy meal options and ONE dessert. They serve this cake, which they call Ya Ya Cake (such a fun name). It’s a slab of chocolate sheet cake, packaged in a plastic to-go container, stacked by the register. The only choice about it, is deciding which piece to purchase. So, after ordering my Greek Salad, I sometimes give in and add a piece of YaYa Cake. And of course, I quickly scan the stack and find the biggest piece… to go with my salad. It is their signature dessert, kinda like it was Grandmother Simpson’s. I love when people’s recipes become “signature recipes”. Sometimes we intentionally purpose these into being and other times they claim us as their own. Ginger Snaps are Lisa’s, Cold Coconut Cake is Gretchen’s, Oatmeal Chocolate Chip Cookies are my sister’s, Plum Cake is Connie’s, Tea Cakes are Melissa’s, and so on and so on. So, what’s your signature recipe? Or what do want it to be? Claim it. Perfect it. Own it. Share it…maybe for generations to come. Preheat oven to 400 degrees. Mix sugar and flour in a large bowl. Set aside. 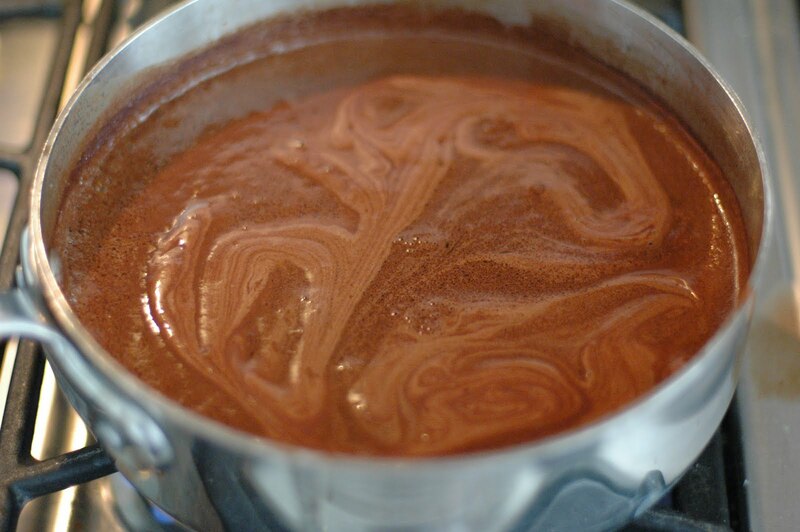 Combine butter, cocoa, shortening, and water in saucepan. Bring to boil 2-3 minutes, stirring constantly. Add cocoa mixture to flour mixture and stir well. Add buttermilk, vanilla, baking soda and eggs. Beat well. Coat 11 x 16 (jelly roll pan – cookie sheet with a lip) with cooking spray. Pour cake batter into pan. Bake for 18 minutes or until toothpick comes out clean. For icing, put butter, cocoa and milk in saucepan. Bring to boil for 2-3 minutes. Remove from heat. Stir in powdered sugar, vanilla and nuts. Mix well. Pour over cake while cake is still warm. Let cake and icing sit until icing begins to harden before serving. This recipe is so interesting. You make both the cake batter and the icing on the stove (I use the same pan twice) and many of the ingredients are the same in both. Mom made this for Levi's dedication ( and a few other babies's dedication)– the serving platter was cleaned in minutes by all the families! delicious!! …and this post just got bookmarked. Thanks! 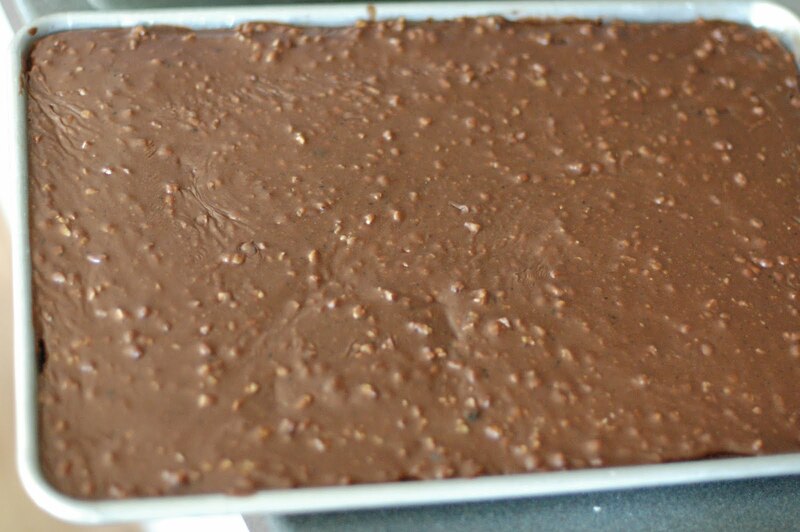 My signature recipe is probably Peanut Butter Mud Bars, which is a recipe I got from The Buttercup Bakeshop cookbook. They're so indulgent but really easy to make. Always a hit. YUM, Tommy! Thanks for sharing. Came across this recipe last night and couldn't wait to try and make it. Delicious!